The No Name Mountain Fire Trail is in the coastal mountain hinterland near Batemans Bay in South Coast NSW. This trip starts 7 km south of BBay and follows Runnyford, Egan and Quart Pot Roads through interesting scenery along good forest tracks for 23 km to the No Name Mountain Fire Trail. For the next 10 km low range ascents and descents prevail. The often rutted track is rocky but clay based, so it would be treacherous in the wet. 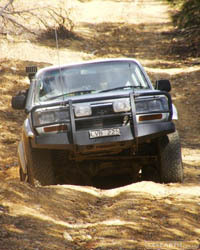 Numerous deep and steep conservation mounds require a vehicle with good clearence.After the Hanns Road turnoff the trail improves on its descent to the Buckenbowra River. An easily missed unmarked side track on the right is actually the continuation of the No Name Mountain Fire Trail. After a short and extremely steep section a river crossing is reached and to the right is an excellent campsite and swimming hole. The trail continues after the crossing through more great country. As the day was getting on we opted for the quicker and easier way out so we backtracked and stayed on the major logging road to Nelligen. It was well worth it as there were excellent coastal views from the Bolaro Mountain Road.